BP Chemicals Enhances Site Safety - De website van salvettifoundation! In the production of acetic acid BP Chemicals is world renowned and responsible for a significant proportion of world capacity. Its proprietary methanol carbonylation technology, Cativa, is in demand globally and in particular in Asia where the company continues to establish new manufacturing partnerships. In the UK its site at Saltend in East Yorkshire is not only a manufacturing flagship but also a major centre for ongoing research and development of the process. Acetic acid is a highly versatile substance. It is perhaps best known as a major constituent in vinegar and other foodstuffs but is also widely used as a chemical intermediate and solvent in paints, adhesives, textiles, papers and chewing gum. It is produced by the combination of carbon monoxide and methanol in the presence of a catalyst. Every year the company invests many millions of pounds in improving production efficiency, minimising environment impact and protecting the workforce. And it is largely with personnel safety in mind that BP Chemicals is now taking a fresh look at how thermal imaging can help minimise leaks. Effective leak detection is of course a site priority at Saltend and one of a number of procedures for ensuring safe operation. As Senior Technologist, Dr. Geoffrey Wilcox confirmed, “We have several established programmes which help us to comply with both regulatory and local requirements.” The EU Chemical Agents Directive to protect the health and safety of workers using chemicals and the Control of Major Accident Hazards Regulations, commonly referred to as COMAH, are typical examples. Bought in 2005, the FLIR GasFindIR camera has been central to Dave Fashimpaur’s troubleshooting work and it now accompanies him all over the world. He added, “There’s no set-up involved. When you switch the camera on it has to cool down to the required temperature but after that you get your images immediately. There’s no post processing involved and I just play the video footage back via Windows Media Player.” The camera allows him to inspect wide areas efficiently and to pinpoint the source of the leak. “I’m looking for motion in the black and white image,” he continued. “Of course that could be steam or metal tags waving in the breeze so my judgement is informed by experience but by changing the lens I can capture the complete scene or a small detail.” The 25mm lens is the most popular but Dave also has 50mm and 100mm for longer range inspection. This now vitally important piece of equipment was one of three cameras recently employed to check plant integrity at the Saltend site. Dave Fashimpaur used his HSX model to detect a range of gases including methane and methanol that are both predominant at the UK plant; HSX is able to detect 20 different gases in total. In addition, a long wave version of the camera was used that is capable of detecting acetic acid, acetic anhydride and ammonia, three of the total of eight products processed at Saltend. Completing the set was a brand new camera in the FLIR GasFindIR family. This model is specifically designed to detect carbon monoxide, CO. To a greater or lesser degree, the majority of process gases at BP Chemicals are hazardous but CO is certainly in a class of its own. Even in the low parts per million it can cause serious health problems and naturally BP ensures that any of its personnel that could potentially come into contact with CO carry personal monitors at all times. The carbon element of CO is obviously a problem environmentally too so the detection of any leaks is doubly important. Although some process areas of BP Chemicals at Saltend are nearly 30 years old this is a site that is exceptionally well maintained and this was born out by the relatively few emissions detected during the IR survey. Nevertheless all three cameras acquitted themselves well by pinpointing several gas leaks. In the case of the HSX camera there had been some previous evidence of leakage at the plant entry point for natural gas from which carbon monoxide is produced. To enhance safety, odour is added to the natural gas and as Process Engineer CS Chung confirmed, “We were able to smell the leak but didn’t know its exact location.” The HSX camera found the culprit to be a leaking flange that has since been tagged for repair during the next maintenance shut down. One of the main sources for the natural gas used in the process is the BP terminal at nearby Dimlington. The site processes in the region of 900 million standard cubic feet of North Sea gas daily. The infrared survey at Dimlington confirmed more than 99% of components to be leak-free. However the HSX camera was able to trace the source of an odour at a condensate sump and small leaks around compressor flange plates. This HSX camera is designed for outdoor use. For that purpose it comes complete with selectable frame acquisition rates to suit the ambient temperature. Too great a heat results in a saturated image and too cold, insufficient detail. This feature ensures optimum performance whatever the ambient temperature so that the GasFindIR can be used with equal efficiency for inspecting hot compressors or sites characterised by permanent ice. Unlike other gases at Saltend CO doesn’t have the advantage of odour and therefore unless the emission exceeds the alarm setting of a personal monitor or a fixed detector, a leak will remain undetected. The first small escapes that the FLIR GasFindIR CO camera found were from an infeed pipe and a heat exchanger flange, both part of an electrically driven compressor. From a gantry in an adjoining covered section of the plant, the camera was then used to inspect a series of steam driven compressors. Two further CO leaks were found. In high sensitivity mode both were clearly visible as plumes of gas. “These were great examples of small and easily fixable leaks that the camera picked up speedily and at a safe distance,” Geoff Wilcox explained. The FLIR GasFindIR LW proved equally effective. 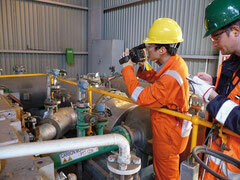 This camera was primarily developed for the detection of the greenhouse gas, sulphur hexafluoride (SF6), but its wider capabilities made it a good choice for BP. It can also ‘see’ acetic acid and therefore provided clear images of small emissions from the vapour space in tankers and from a vent in the roof of the loading bay. It also identified small escapes from automatic loading arms whose emissions are largely controlled by recovery systems. Ammonia is another gas detectable by this LW camera and this was seen in a vent situated 20m above ground level with the camera position at a distance of 150m or so. FLIR GasFindIR cameras are increasingly being adopted by plants across the world for the visualization and documentation of gas leaks. The reasons for this were clearly demonstrated at BP Chemicals. FLIR GasFindIR can scan large areas rapidly and pinpoint leaks in real time. It is ideal for monitoring plant that is difficult to reach with contact measurement tools and literally thousands of components can be scanned per shift without the need to interrupt the process. It reduces repair downtime and provides verification of the process. And above all it is exceptionally safe, allowing potentially dangerous leaks to be monitored from several meters away.